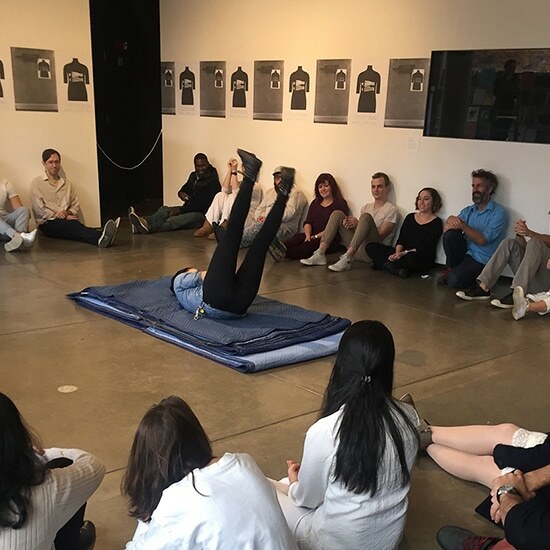 Students in the MFA program in Interdisciplinary Arts at Northeastern University participated in a workshop with the art collective, Futurefarmers as they prepared for their exhibition at the Carpenter Center exhibition, Errata—Brief Interruptions. The student contributed personal definitions of the word “error,” engaged in a performance exercise the artists, and then moved to the Robbins Philosophy Library to locate the errata that were included in the exhibition and companion book. The following is an edited transcript of a dialogue between Dave Cohn, Evan Cheng, and Hannah Groudas, reflecting on this workshop, the conversation, and the exhibition. HG: We’ve thought a lot this year about how an artist’s research can take many forms. For me, what’s so interesting about Futurefarmers is that they approach a specific research idea from numerous angles as a way to tie together loose ends from previous projects with new material to create a narrative composed of otherwise unrelated things. DC: Because they string their endeavors together in response to the previous one, their work develops in a somewhat happenstance way. HG: Right, it was made clear that this project was an extension of their 2010 project, Erratum, where they thought about errors of production by physically (and laboriously) transforming toilets that had been replaced with higher efficiency models into rubble and then re-forming the material into bricks. EC: They present their process of exploring ideas and doing research instead of showing the results, which to me is a way to present the connections they make. It is interesting that they reveal the whole development of their concepts. DC: When you transform a toilet into bricks, there’s a natural question: “why?” or “how are those two objects related?” or “what is it that you are trying to accomplish?” I fall into a common tendency in our culture: a need to know what something is about, or a need for an exhaustive description of the work that can stand in for the work. It’s as if I need there to be an exchange value for the idea so that there can be value in sharing it or making my own claim about it. At first I felt like the playfulness of their general artistic process was partly a tactic for obscuring those questions. HG: Actually, I think they were bringing us into their work as much as they could: they wanted us to share in their excitement for uncommon curiosity and discovery, because this excitement was the basis of their work. Their procedure is so nonlinear that it is easy to feel at a loss at first. Participating in the workshop shed light into just how meandering—yet delightful— their process really is. EC: Yes, I agree. Their works also involve a lot of narrative and explanation of the backstory— the relationship between different periods of work. Their projects are sets of causal relationships rather than themes or ideas. For instance, they had a staged, time-lapse video of them smashing the toilet, which was both documentation and the art itself. The leftover material was then turned into bricks labeled with the word “errata” through the use of custom self-crafted molds. Brick-manufacturing in turn became the subject of their next creative move. This project did something similar: exposing the process instead of only the result. The books, artist talks, performances, and workshops, all function together to present the narrative. Maybe because their work is so linked in both its time and its forms, you could feel lost without immediate access to some of their previous projects or without seeing all the supporting forms of work. DC: Yes, there was not a singular, discrete point of entry. I had expected to be given a clear idea of what their work was about, but because of this tactic of always gathering excess from prior projects, there was not a definitive answer to that kind of “what” or “why” question. When we got to the workshop, they prompted us to take turns falling onto a mat, as if we accidentally tripped. This served as an introduction to the idea of mistakes, but it also felt like a leap of faith into this playful method of exploration. EC: Amy and Michael actively cultivate those points of entry. They arrange the workshop and take care of the logistics that go into it so that a group of people can participate in it. Therefore, a viewer’s rigidness of needing to be told– rather than guided through– the work may create a distance from the work. The leap of faith was more like initiating a conversation, so that there can be a two-way exchange rather than thinking of the artist as producer and the viewer as consumer. DC: That makes sense. There was something about their work that elicited questions, but the questions were all answerable if you spent enough time exploring their work. Maybe it was actually this transparency of the process, and the fact that documenting the process was essentially what the work was that made me feel initially that there was some intentional obscuring of their goal. HG: And yet certain decisions do have to be made about what to keep and what format to translate things into. In this workshop setting, they didn’t necessarily know what to expect from us, so they don't know what they'll end up with or what documentation method would be most appropriate. It made sense for Amy and Michael to ask us to contribute to the conversation in different ways and therefore to document in different ways, so as to preserve a variety of potential directions to take. Artists who work in more traditional mediums will often keep a sketchbook for material generation and end up only keeping what they find the most appealing. They made us a part of their living sketchbook. EC: Part of their filtering process seemed to involve shaping the context of their work in their space— the connection and link between each work can give visitors a better sense of what they are doing. The history of their work can be clearer to us when we can get a glimpse of several points of entry at once. 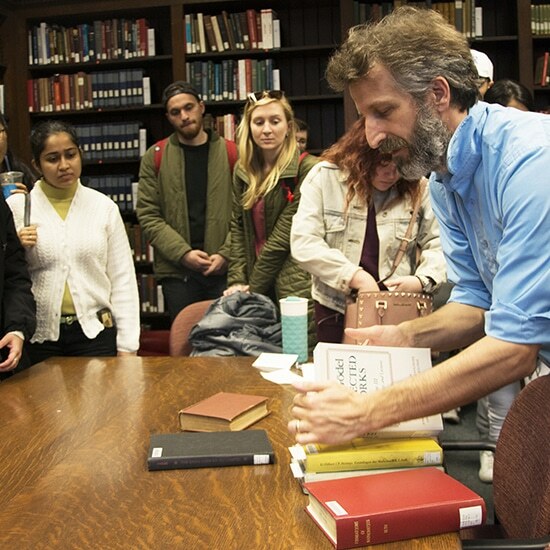 DC: As part of the workshop, we all scoured the texts in Harvard’s philosophy library for notes of typos –called “errata”– and these errors became integrated into these uniquely designed books. Their exhibition, their process, and the books came together and supported one another. I hadn't realized how integral these other forms were until our meeting with them. Interestingly, the byproduct of the process gets as much attention as the product: the errata in the exhibition and the book of collected errata are both part of the result. HG: Yes, it seemed like the book was both documentation and art object, a combination of writing and images that accounted for its own window into the erratum project. Only a small number of them were created and they deviated in some significant ways from the traditional layout of a book– they were not simply play-by-plays of the project but were engaging objects independently. Finally, the performance was a way to activate a certain trajectory of thought without being overly concerned about the result or the path taken. EC: The work takes many forms, with no one form encapsulating the whole thing. Instead, there is a network of interrelated experiences. And yet I think there is a singular takeaway having to do with disengaging from that “what” question by prioritizing process. It makes me think about a retreat from standard modes of engaging, not just with art but with the world in general. Their work is outside a certain system of comprehension and making meaning and they want you to join them outside. The workshop was an invitation to that “outside” and to co-inhabit their processes.